Did anyone notice? Steve Lewis sent me, along with some other folks with a bibliographic bent, the addenda to Allen Hubin's crime fiction bibliography and there I noticed that Tedd Thomey had died in 2008. Quick Googling reveals that he died in December - and that he worked also as a restaurant critic! So, who he? you ask. 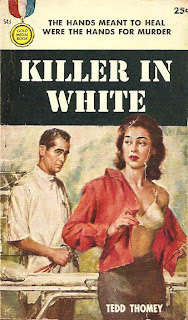 Tedd Thomey wrote some crime paperbacks in the fifties and the sixties, one of them being the excellent Killer in White (1956), a very Jim Thompson -like foray into a psychotic mind, this time working as a fake doctor. Pulp, paperback and film historian Lee Server has said good things about Thomey's hardback crime novel, And Dream of Evil (1954). His other crime novels, according to an early edition of Hubin's bibliography, are Flight to Takla-Ma (Monarch 1962) and I Want Out (Ace 1959; I think this was an Ace Double). There's also The Sadist (Berkley 1961), about which the Abebooks seller says thusly: "Mystery about the kidnapping of a guy's three-day bride by a man with a twisted criminal mind." This seems to be the only complete bibliography of him in the web, and it leaves out the publishers and the years - but it's interesting to read about Thomey's early career! Edit: Here's Steve Lewis's quick obit, with more bibliographic info!